Happy Friday everyone! I'm so thrilled it's finally the weekend. Thank you for your sweet comments about my stressful week, I really appreciated it. But, now it's time for some R&R. 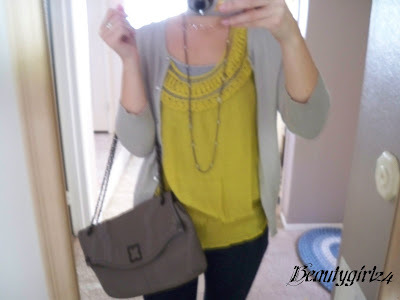 And maybe a couple drinks later ;) Yesterday I blogged about a mustard top that I bought recently at Forever 21. I just love the color. 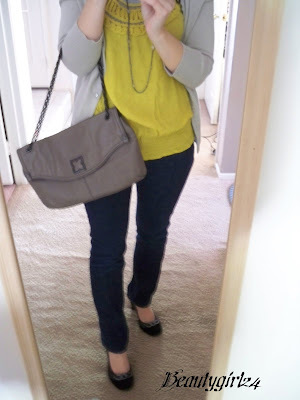 I honestly can say that I have never worn yellow in my life. I'm not one to bring too much attention to myself, and I always thought that yellow was too "notice me." As soon as I put this top on, my mood was lifted instantly! And in my opinion, that's what clothes should do. Long Necklace: Macy's? It's very old. I love this look. I put on one of my only brightly coloured tops this morning and just couldn't bring myself to wear it. lol. I think you look great though, so maybe I'll give it another try! Looks so good on you! That is such a classy combo, hope your weekend is relaxing!! i love your outfit and that bag is too die for! i want it!!! you look fab mama! Cute outfit...n the bag looks fab! Love yellow on you! About Lulu's-the Chilltown dress is so cute and fits TTS. The quality is very good for the price. I have had a couple problems with Lulu's (but it hasn't deterred me from continuing to shop), twice they sent me a dress in the wrong color, but they're a reliable, fast company and they have free returns/shipping. Let me know if you get the dress or have any other questions! I looooooove the way you put the whole outfit together!